I can't believe it! Teacher by trade - Mother by nature will be turning ONE this weekend! How crazy is that? Just like a baby, a blog reaches many milestone moments - from the first post, 100 Likes, first comment to the FIRST YEAR of blogging and everything in between. I created Teacher by trade - Mother by nature a few months after my son was born. I needed to keep my mind stimulated, and wanted a place where I could share my thoughts, interests and things that I am passionate about - rather than sharing it on my personal page. I was really excited about my new 'blogging' journey and it gave me an excuse to be on Facebook (ha!). The name Teacher by trade - Mother by nature has been with me for many years. When people ask me what I do, I tell them I am a teacher by trade (it's my career) and a mother by nature - Mum to Miss B and Master M. I felt it was the perfect name and it describes who I am, so I went with it and I love it! I never thought in a million years I would call myself a 'blogger' and that Teacher by trade - Mother by nature would be where it is today! I have learned so much in my first year of blogging and I am really enjoying the experience. Yes, there have been times where I have had to walk away from the laptop, but at the end of the day, blogging makes me happy - it's my space, it is who I am now and I enjoy connecting with people around the world and hopefully inspiring them. Teacher by trade - Mother by nature is where I can share tidbits of my life, home and family and I am really glad that you are with me every step of the way. I want to personally 'Thank You' all for reading, commenting, liking, sharing, pinning my posts, tweeting, following me on Instagram and subscribing to my blog. 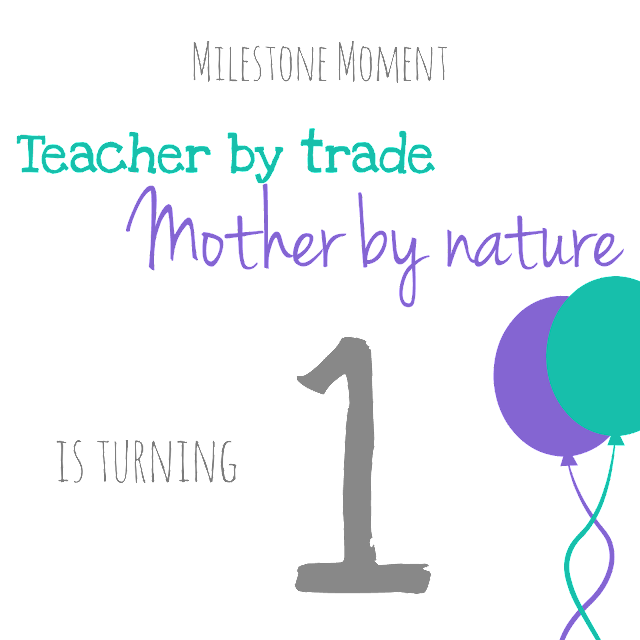 To celebrate ONE YEAR of Teacher by trade - Mother by nature, I will be announcing a special giveaway* on Saturday, so watch this space. Lisa of The Golden Spoons, Janine of Confessions of a Mommyholic, and Marcia of Blogitudes. Thank you so much Marcia! I really love blogging - and have an awesome blogging family (you included) - I look forward to growing my blog and sharing what I love the most! Naww thanks Janine! (warm fuzzies) So glad I 'met' you via these link ups :) I enjoy reading your blog each week! Thank you for all your support. Congratulations!! I completely agree - I have to walk away from my blog once in a while, but I always some back because eI love it. I also love that I have "met" so many wonderful people, including you! I've said it before and I'm going to say it again - You are an inspiration, Lisa! You have taught me so much about being a blogger and a mother too. I am so glad I found your blog (your blog theme post and then #TuesdayTen link up)...it is a huge part of TTMN. I look forward to catching up with you every week! Thank you! I have definitely grown as a blogger. I am very proud of myself and my little blog, when I do reach milestones. Such a great feeling. Thank you Chrys...I know first year bloggers that have had a way more successful year than me too! Everyone is different. It's hard not to compare yourself to other bloggers. As long as you are proud of YOUR success - that's the main thing. Congrats on your one year! I look forward to following your blog! Thank you Jessica and welcome to my blog - Lovely to have you here! Congrats on your first blogoversary! It's a big deal starting a blog and sticking with it - so very well done! Thank you Denyse! I agree! It's awesome seeing other teachers blog. Heading over to check out your blog now! oops, Can't seem to reach your blog Denyse. What is your blog called?